Many seem to be following the “if you build it they will come” business plan. Most of your market is trying to find you by searching somewhere – whether that is on a search engine, blog search, on their favorite Social Networking sites, using search tools like FeelTipTop or in Local Search Directories. The very first thing every business, blog, or ecommerce site needs to know is what their most important keyword phrases are – because how you write about and promote those phrases determines whether your Web site gets found online and by how many. Make this task your highest priority today. First identify your target audience – who would look for what you offer and where do they look? Brainstorm – ideally with others – how your target audience would go about searching for you online. What exact words and phrases would they use? Remember that many will NOT know your industry jargon or the specific names you use. Still stuck? Read these Branding Tips to trigger more ideas for how to determine who your target audience is. Check your existing positions for those phrases (see tools below). Your target is to be found on the first page of results at Google, Yahoo and Bing. Identify your very best page or post for each phrase. If you don’t have a compelling pillar post for that phrase create one. There are many others but the first two are what I use most and the last two are what Murray Newlands recommends on his Affiliate Marketing Blog. Free SEOBOOK Rank Checker – How to use Rank Checker to check your search engine positions. If you have the SEOBook Toolbar the RankChecker is built into it. If each of us will take the time to share this type of information with our collaborators, it will make a HUGE difference in the results we will see and how fast we attain them. Once we have this information we can select the best anchor text and landing page to use whenever we link to each other. When I blog I also add Twitter IDs and I recommend doing that too. In case anyone doesn’t know, anchor text is simply the words that are used in hyperlinks you create. Instead of always using someone’s blog name or their name start LINKING their optimum anchor text phrases because your target audience includes the masses who don’t know your business name or blog yet. NOTE: This post was originally published in 2009. Edited and republished 3/11/15. Hi Gail, nice article for keyword research and thanks for sharing your knowledge about these tools, it is of great importance would love to try them out. I currently use keyword everywhere and Ubersuggest. Thank you so much, Keep posting. thanks for sharing awesome post keyword selection is most important and technical part of seo its depend website ‘s traffic and ranking. This is a great article, i recommend this to everyone who wants to know how to pick up a good keyword for niche site. Before i use google keyword planner but now , i use long tail keyword because there are a lot of competition and long tail give a good keyword without any hard work. Great article! I have used google keyword tool and it’s really useful to see if that specific keyword has high, low or medium competition. That brainstorming term I have never heard but I have done similar things by writing down possible keywords that people search on google. Thanks for sharing this important info,you are great.Keyword is very important to get people notice your post when rank for such keyword, but most cases people find it difficult to find low keyword that can easily rank on Google and other search engines. Nice Article I am a new blogger and so not have much knowledge about choosing keywords. My blog’s Indian Alexa rank gradually increases, but that of global rank is not affected faster. My question is, that which Competition type keyword is good for my blog. anyways useful guide on choosing right keywords for your blog.The post is unique.I do not here or read anything like this.I agree to the author that Keyword play great role to increase website traffic. I am a new blogger and so not have much knowledge about choosing keywords. My blog’s Indian Alexa rank gradually increases, but that of global rank is not affected faster. My question is, that which Competition type keyword is good for my blog. Is it Low, Medium or High Competition type? I have a tip for you. Since you write about technology, one way to get traffic is to write about brand new devices early before anyone else does. I know one young blogger whose site ranked first for a hot new phone because he wrote about it really early. Another way is to include compelling images and video reviews in your posts. These get shared more often and keep visitors on your site longer. Low competition keywords are easier to rank for but often have fewer searches and therefore a more limited ability to drive traffic to your site. They can often be longer phrases that can have fewer sites that match, making it easier for your site to rank. Installing CommentLuv and going out commenting is one way to build a community around your blog. Growing a mailing list is another. Participating in groups on Facebook, LinkedIn, Google Plus or other social networks can help as can growing your audience on each social platform. It looks like you are targeting an Indian audience? If so, focus on groups specifically for Indians. Also inquire into whether you can submit content to Indian tech sites related to yours like http://businesstoday.intoday.in. Think of keywords another way. You want to keep each post on target as you’re writing it, so choose a 2-3 word phrase you want to write about and make sure the entire post is only about that. Write the best content you can, add visual appeal, promote it on social networks. These will give it at least some opportunity to have other sites link to you. Thank you so much for sharing this tools. I have used keyword research tool. It is great to use and really helpful. This technique is really useful and easy to understand. It’s really easy steps to research my keywords . Thank you so much for sharing this tools. You really make it seem really easy together with your presentation however I find this matter to be actually one thing which I believe I would by no means understand. mobidhan would love you to read ..Sania Mirza and Yuvraj Singh on Farah Ki Daawat! Hi Gail, Nice Information That You Have Shared With Us. This Article helped Me To A Lot Of Time On Searching. This Technique Is Really Useful And Easy To Understand. Thank You. Keyword play main role in your online business and internet marketing business. 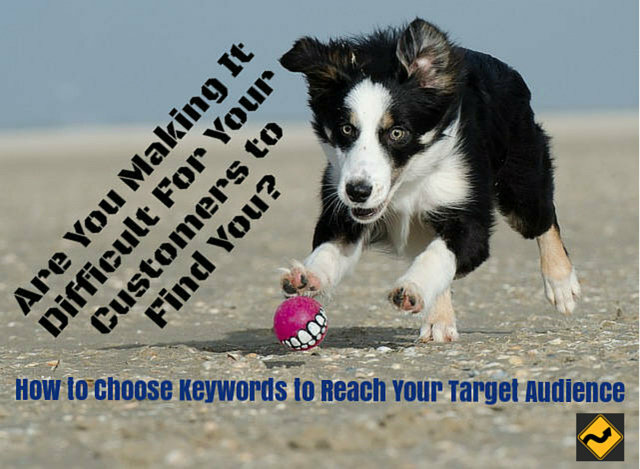 Choosing specific keyword can get you great success . I have used keyword research tool. It is great to use and really helpful. Fantastic guide and it’s very reliable sources on How to Choose Keywords to Reach Your Target Audience. Thanks for sharing this article. Great post! Traffic building is an important part for a website development and Ranking or position of a website. Thanks for the informative information. I want to do SEO marketing related business but I need a good tool for keyword maker. thanks for informative information about seo, i really need this type of post, i like your post keep it up. As far as growing traffic goes…You have to take a close look at grabbing emails and getting a regular newsletter/update out to them. That will compound (slowly at first) but it will grow! I have to agree with that Franklin MA Real Estate guy…SEO is central to everything because you need to start out with traffic…or you have nothing. Good points! We have to focus on a certain group of people to get more traffic and conversions. That may sound a bit contradictory because how can reducing the size of our target market can actually increase our traffic, but by doing that we can give better quality content to them because we can give them exactly what they want. And we can do that by using social media and visiting related blogs. The look and feel of a website is vital to anyone’s success online. You have about ten seconds to capture a reader. After that content becomes critical. Lastly without proper SEO none of it will work. You need to be found in order to make everything come together! You are right about doing keyword research. It is so critical to get that right at the beginning of your blog, website development or SEO project. I can’t stress that enough. I’ve been using Market Samurai in searching got the target keyword that we need. It is important that we think very carefully on what keyword niche that we need for the website and what strategy you have ti use just like @Buffalo have said. James, I also use Market Samurai has the target keywords in the search. Actually we need to build traffic but this is only possible to create a unique content and that is always valuable to our blogs. Building traffic is always important to our content/ business blog. I agree that we always need to consider the key questions about our target audience and our exact words and phrases- like anchor texts. Tips here are nice and accurate. I remember back when I had the build it they will come mindset. Largely because someone I was following was just like “build a blog and write a lot of content on it.” You can imagine how well that worked out, and sooner or later where I politely suggested this individual could stuff his advice. Do you know of a rankchecking tool that you can download as a seperate program? I want the functionality like RankChecker but without having to install another plugin on my firefox. Targeted traffic is important. It does not matter whether we get 1k hits daily. The point is, the visits must be targeted. Another reason targeted traffic is so important: When you go to see advertising on your site the more niche and focused your readers are the more they are worth, no matter what the niche is. You have some very good points here. I always stress to the client how important it is for them to help me brainstorm their keyword lists as they know their industry better than anyone else. I can research keywords about an electrician all day long, but the electrician’s input will help ensure that I reach all the potential keywords he could target. It is very useful for me. I am a backlink writer . I’ve read this branding tips post and it is very helpful to me as a website promoter. Yes we absolutely have a complete solution to spam that stops almost all of it instantly. See our GrowMap anti-spambot anti-spam solution>. When I first started hearing about SEO, it seemed like a foreign language. I was only concerned about on page optimization, so my only tools were keyword density. Now everything has changed so much, that we are forced to use many tools. I also use the SEOMoz toolbar, but mainly go their open site explorer. Now if only there was a decent tool to check keyword competitiveness. Very good points. I am really glad finding this one, it gives me more idea that hopefully will help me. Thanks! I just want to add one thing to the keyword/anchor text discussion. It’s vital that not only do you target one keyword phrase, but a family of related phrases. Not only does this enable you to reach a wider portion of your target audience, but also speaks volumes to the search engines about your topic and avoids getting your posts flagged as overly targeted. Late to the game on this one, but this post is right on! Targeting keywords and search terms is a big part of all of it. I see way to many get stuck trying to go for the competitive keywords, when they should be actually focused on the low hanging long tail keyword fruit. Doing this allows you to build momentum and energy. Exactly what a business needs. Quality content is usually still relevant over time – and these same concepts have been true for as long as I have been building Web sites online (since about 1995). I have assisted many in selecting their keywords and I consistently see them choosing either phrases that are far too general or way too long. If someone doesn’t get advice on anything else I hope they will at least accept it for this because if you get this wrong you will be spinning your wheels for a long time and going nowhere. The next step after knowing what keyword phrases to target is to get in content links from related sites. Our blog collaboration is a great way to do that. Hey dude, I think you make some excellent points here, especially about knowing who your target audience is. I think it’s vital, as you said they may not know the industry jargon and terms etc, so it pays to know who your audience is and how they’re going to find you. Assuming that potential customers and clients know what your business or industry chooses to call things is a huge mistake. Eventually they may, but when they first seek you out they often use searches most businesses would never anticipate. That is why you have to ask around. It’s important to identify your primary keyword and your target audience but it’s even more important to build a reputation in that audience. If you outsource anyone to do your marketing campaign then make sure that the company you outsource to, is as careful as you’re with your reputation. That is very good advice that many companies are failing to heed. Many are hiring companies to build links by commenting apparently not realizing that those comments reflect on their business reputation. Read my post about blogging niches for ideas that may benefit your older blogs too. Consider adding a category to reach a specific audience or creating blogs that have a specific audience. That is where the demand for advertising will be. growmap would love you to read ..How NOT To Monetize Your Blog! Keyword Too External is my favorite Keyword Research tool.After all it is Google own tool so it will not provide any wrong information.Apart from that it’s Wordtracker that I prefer most. Yeah, those 2 questions can make “magic” for your business IF you answer them right. There are all kinds of tools available. I also use Google’s tools but prefer to use independent solutions whenever possible. .-= neil@one way links´s featured blog ..Standard Membership Free! =-. Wow, I have been going at this all wrong. I was using the name of my blog and not my keywords. Lol I feel stupid. .-= KyAus @ Online Mobile Backup´s featured blog ..Webmasters Dont Get Scammed =-. Don’t feel stupid. Almost all bloggers are doing that and even successful bloggers usually have no idea how someone searching for their information would ever find them when I ask. I’m interested in work at home info. Your site is nice! .-= Chris@Classic Cars for Sale´s featured blog ..1952 Mercedes Benz 300 Adenauer for Sale =-. I know how that is. I clicked on SEO XRay the other day and went “hey! that’s just what I wanted” – and have been doing manually because I forgot it was on there. Thank you for the detailed post Gail. This post is actually one of those that every potential SEO company customer should read ahead to be perfectly honest. Sometimes some companies that apply to us are so “interesting” that we often find out that they’ve been targeting the wrong audience for their website for a long time and even if there was a successful marketing campaign before coming to us, it would fail miserably. Those are the ones that truly play “hide and seek” with their market. Most business and Web site owners have never even figured out who their target audience is much less how they would be searching to find them. I would love to hear how you use the two toolbars differently. That sounds like a great guest post idea. If the market crashes, what will paper money be worth? What would be a good currency to hide under the bed? Even if the market doesn’t crash paper money won’t be worth much. Although gold, silver and platinum will hold their value and pearls should go up steeply (because polution is reducing the ability to grow cultured pearls = lower supply and rising prices), what people really need are NECESSITIES. Growing a garden and stocking up on staples such as beans, rice, pasta, flour, corn meal, sugar – storing them properly is critical. People need to learn how to cook staples from scratch. Did you know 20 pounds of potatoes costs the same as one bag of potato chips? That many potatoes go a long way! Even if you can make $100 / hour it is better to plant a garden because even $100 might not buy much food when hyper-inflation kicks in – and that $100/hr work might evaporate when 30-35% or more are unemployed and another 30-40% are underemployed. Finally, when things get really bad being surrounded by desperate, hungry people will be dangerous so if you have the wisdom and foresight you need to be living in a remote area at least three hours from any sizeable town or city with others who are prepared too. People are not likely to go roaming far from where they live as gasoline prices will be high and money scarce so if you are far enough away the danger of violence will be minimal. There are stats and links in the Word of Mouth Marketing post in CommentLuv that clearly show how bad it already is. Only the naive should be believing the media spin that we are “in recovery” but “could slip back into recession”. Select appropriate keyword phrases and place them in the most strategic locations, where there are maximum chances for the spiders of the search engines to read, crawl and index them. Providing keywords in the headings, in the initial part of the first paragraphs, in the page titles, file names and directory names, are some of the commonly used strategies for improving your page ranking. You can also consider including keyword phrases in the URLs or domain names of your websites. Good point about using keywords in domain names. That is a strategy many power affiliate marketers use to increase their incomes. .-= atics´s featured blog ..iPhone 4G Apple’s newest gadget introduced on Monday =-. Yeah but links don’t always equal traffic. Like a road leading to your restaurant. If the road leads to nowhere… there you go. I’m sorry Goose but you know I can’t allow links to adults sites. Yours is the very first CommentLuv enabled blog I’ve ever seen although I suspect there may be others. I have emailed Andy to see what his policy is on this subject. Those who focus on building links from sites related to theirs are more likely to reap the benefits of both direct traffic and more visitors from the search engines. I didn’t understand why you gave that title to your blog? Pus I feel so much have been incorporated in a single blog post. Rather you could have opted for all these topics in different posts. I mean to say one topic per post. This would have even enabled you to have more topics in hand for different posts. yes, the keywords you target in your anchor text are so, so important. I guess they relate very much to ‘relevancy’ in Google. Long tail key phrases, say 3-6 words – are so specific and easier to get a high ranking on, but drive less traffic. As long as they result in ‘buyer’ actions like conversions and opt-ins then they’re great to focus on. Thanks for a great blog incorporating the latest plugins. I’ll be real choosy about blogs in future! GD. .-= Geoff Dodd@Residual Income´s featured blog ..Local Business Internet Marketing =-. I believe you’re speaking about niche marketing over here. Having a true niche will also build your confidence, both in your marketing strategies and in your business in general. If you love doing the work, it is probably something you have been educated or trained to do. Finding that niche will help you to perfect your skills. With those perfected skills, you will be able to sell yourself and your services in a positive way to your prospective customers through niche marketing. This concept applies to every site no matter whether it is a blog, a static site or an ecommerce store. This blog is unlike most others in that I love links that allow me and my readers to quickly hone in on the information someone is talking about on their site or any other site. If you see this please feel free to reply with specific links to articles related to this post. Since our blogs are related please do this in any post that relates to any of your content. As long as your links are relevant they are welcome in any number. I encourage you to use the best anchor text for each link and consider registering your site at CommentLuv. Their new default links allow you to leave anchor text links in any CommentLuv site. There are already 20,000+ bloggers using CommentLuv and that number is growing rapidly. Their mailing list grew from 10,000+ to over 11,000 just in the last month. For more information about how bloggers can improve their own economic conditions by supporting small businesses by allowing do follow links through KeywordLuv and CommentLuv see the CommentLuv featured post in this reply. really very useful tips and suggestion you posted here.i started working hope to get good results. Many readers can use these tools to start managing their search positions. .-= Roger Bryan´s last blog ..Affiliate Marketing Tips for Increased Sales =-. I sincerely hope they will. Thanks for such excellent tips. As per your post i think we can’t play hide and seek with market but market can do this with us. Thank you for this very generous blog. You’re right, there are many people searching ‘make money online.’ And yes, there are also many people who succeeded. But they must work very, very hard before they see fruits of their labor. Few realize that you can not get rich online overnight but they may believe they can because of misleading affiliate marketing. While a well-connected marketer with a huge list CAN do that someone brand new can NOT. I truly wonder how many companies ARE, as I’m typing this, playing hide and seek with their market. Great tips! Most of them, unfortunately. I just replied to a comment in another post about waiting until your links grow organically instead of doing anything proactive to make your business easier to find. That simply makes no sense except to those who don’t want you competing with them that write that type of disinformation. Many businesses don’t put enough thought into how their potential buyers are searching for them. Using terms that are commonly known by insiders but not by the general public is a common mistake. .-= growmap´s last blog ..Keyword Tags, MetaTags, Tags – How Many is Best? =-. Worrying doesn’t help anyone but taking the right actions really will. There are so many ways to grow a business online that do not require money and shortcuts to hours of work by paying a small fee such as the Local Search Directory Listing Service we recommend. Great post to learn the basics about keyword search and tracking. I’ve been using the recommended resources for a while now and they work great! Thatnk you. I hope many readers use the tools and start managing their search positions. It can make a HUGE difference in traffic and for businesses that sell products or services generate many more leads and sales. You are wise to be learning and implementing what is known to work. Your latest post shows much wisdom; it is very easy to spend too much time reading and learning and not nearly enough time acting. It is good that you know that already. I hope you will come by regularly and share your experience with others here and attract them to your own blog by what you write here and the CommentLuv posts you feature. Great article. I have been doing this lately. At first I started a blog and targeted the wrong keyword but my audience was the same. Now I am getting a better idea of my audience and what keywords they are searching and will use that to drive more traffic and offer what they are looking. The pillar articles really do help and I am getting into this also. Thanks for the tips. .-= meka@earning money online´s last blog ..Is Earning Money Online Distracting You From Earning Money Online? =-. When I build websites for clients I parallel the topic of your post, or at least I try, to a new restaurant. It usually clears up any confusion they have. Then of course, we start the brainstorming process. .-= Mike from Silver Celtic Ring´s last undefined ..Response cached until Fri 29 @ 2:32 GMT (Refreshes in 23.87 Hours) =-. Welcome Mike and thank you for sharing that allegory. Your clients are fortunate that you discuss this with them before you start building their sites. Many Web Designers make pretty sites but don’t understand that what you don’t see is often more important. I hope you become a regular here. I don’t use a blog the way many do; I use it as a reference resource. Check out the Best of GrowMap post to get an idea which posts have significant resources in them. Skimming the posts that appear in the Most Popular section at the top right or the categories and sub-categories in the bottom right are also a good way to hone in on the information you will find most useful. When you leave comments in this or any KeywordLuv blog put YourName @ Your Keywords to get the anchor text you wish to link properly. I’ll fix this one for you next time I log in if I remember. First and second points (that you mentioned) are really important when building any website. Normally during marketing or developing phase no one thinks about targeted customers. They make websites with huge database and when it fails, they always wonder “Why my website has failed even with such a huge database”. Local online marketing techniques always give you edge over others. Thank you for your comment. Read the reply in the comment below this one if you would like to turn all your comments here into well-targeted incoming links for your Web sites. .-= Gail @ Social Media Marketing´s last blog ..AdJump Demographically Targeted Ads Deliver Over 1.5 Million International Leads Monthly =-. Before you build your site one should go for the Keyword research. and do the seo for the same which will bring your site to the top rank in the search engine and get organic result for the site. which mean user get the site for which keyword he/she is searching for. Convert rate will be high and your business will grow. Doing it before you start is helpful when you are deciding what type of site to build. For many small businesses they already know what they want to put on their sites but they often don’t think about how their potential customers will search for them. I do hope they read and understand this post and ask for clarification if they need any. It is not obvious to most people – not even most bloggers – that you have to include variations of phrases to make sure you are easy to find. .-= Gail @ Social Media Marketing´s last blog ..Donation Coder Annual New Apps for the New Year NANY 2010 Annual Challenge =-. .-= Christine Dyer´s last blog ..Krystal Johnson commented on the group ‘Wedding Vendor Link Exchange’ =-. That is great news Christine. The easier you are to find the more people will use your Wedding Forum. Did you know you can automatically create a link for your chosen anchor text in blogs like mine that use KeywordLuv? Just put Christine Dyer @ Wedding Forum in the Name field and every comment you leave here becomes a dofollow link to your site using that anchor text. Gail – great job with all the resources in this post. I had not heard of TipTop but just checked it out. Pretty cool tool. I’m still defining some of the points in your post for my own site but def agree with #3 about using words that people would search for. I think that is how I “accidentally” got a few posts of mine into the top search results on Google and they are still my most frequented posts. Yes, that is how a site “accidentally” gets ranked and how smart bloggers and businesses can make themselves far easier to find online. Nothing is more important right now to any Web site owner – NOTHING! A good blog how to generate traffics in the sites. Website owners must be pleased with you.Do some hard SEO you will meet your ranking. I hope at least some Web site owners do apply what I share here. It definitely will be beneficial to them. .-= Gail @ Social Media Marketing´s last blog ..MEME: LinkLuv to My Fav Bloggers Favs =-. .-= Brian H. Gadget, Entertainment and Travel News´s last blog ..Aliph™ Introduces Jawbone ICON™, The World’s First Truly Intelligent Bluetooth® Headset =-. All you need to do is target specific two to three word phrases. You can start with the comments you leave in KeywordLuv blogs like this one. I know this is a confusing subject so I hope you don’t mind me using your comment as a teaching example. You used “Brian H. Gadget, Entertainment and Travel News” as your anchor text. How many do you suppose will be searching for that exact phrase? If any do they would already know about you. Use the keyword tools to find out what people are searching for and plug the phrases you select into the SEOBook Search Engine Ranking Checker I mentioned. Find out where you rank now (probably nowhere which will be shown by a dash (-) . Start targeting that phrase – that is your new anchor text – and land it on the best page for each phrase. Share your best phrases with those who link to you and use them in your comments. Do this consistently and then run that report again to see how you’re doing. Excellent tips condensed in compact form making it weight heavier and most useful. I copied the article and pasted in my Doc file so that I can refer to it when I don’t have internet connection. Regarding brainstorming and using the actual words the searchers are likely to type in search boxes, I have found many time, it won’t always be interesting. I know, I need to choose title in such a way that it includes the main keywords. But most of the time I found my title become less testy to include all those words that users will type in their search boxes. But I believe a balanced composition will help aesthetic value and search engine affection too! .-= Suresh Khanal´s last blog ..Do I need permission to link to other websites in my post? =-. Excellent copywriting is not easy. Every time I read something that says someone whipped out a blog post or article in thirty minutes I want to choke. I believe in quality and that takes time – often hours and hours. The same is true of titles. Lyndon Antcliff is a highly paid expert on linkbait – we actually call him the Linkbait King – gets a princely sum for writing ONE title because that is so important to getting an email opened or a blog post read. The best copywriters can get $10,000+ per mailing piece because of the high conversion rates they generate. Brilliant conversion experts can double, triple, even quadruple sales or more because they understand what works – and just as importantly – what doesn’t. What we write must flow for our readers and also be easily found by them. That is the key – and the great challenge. .-= Chris@Benefits of Kefir´s last blog ..Spring is Calling and So is My Square Foot Garden =-. Yes i think first you have to target your audience and should analysis for keyword competition and blog commenting is the crucial part .Great to read! Success depends on doing this. I just hope bloggers and business owners will take it to heart. It really can make all the difference. Every person knows that finding for BUSINESS can be a exhausting and disappointing project if the person does not know the appropriate source of exploring. What individuals don’t know is that the net is the exact way of BUSINESS. We are fortunate to have the Internet. It can save many small businesses that might otherwise fail in the declining U.S. economy IF they know what to do and act quickly. .-= GrowMap @ Social Media Marketing´s last blog ..Wedding Boom Predicted for Next 22 Years =-. .-= Alex @ Van Seat Covers´s last blog ..Seat Covers for Vans =-. I can see you have this anchor text thing down. I hope you’ll be a regular reader. Best of GrowMap, is a good place to find out what else I’ve written that you could really use. .-= GrowMap @ Social Media Marketing´s last blog ..How to Use TipTop for Real Time Market Research =-. I hope you’ll become a regular reader. Do make sure your business is listed in the Local Search Directories. A very good piece of work for the beginners. I surely agree with you on optimizing for long tail keywords. Their conversion potential is very strong – and long-lasting. Keep posting!!! I assure everyone that this is not just for beginners. It is key to online success for everyone. .-= sarika@Upper Cervical Software´s last blog ..Zeina & Zak. Westin Hotel Wedding. =-. This is really good IG, and although it seems like a lot of work it’s absolutely necessary for those who want to get ahead of the rest. Lucky for me I don’t have a niche or target audience or anything. I don’t do keyword research, although I may take a minute or two to shove some in the title or post or something. Sure I could be getting a whole lot more traffic, but then I’d enjoy blogging a whole lot less, and we can’t be having that now can we? .-= Sire´s last blog ..How To Stop Infolinks From Appearing In Your Comments =-. Everyone has a target audience. Yours appears to me to be other bloggers. If you would select some phrases and specific pages to land them on and share that information with me and other bloggers you interact with regularly we could move you up in the search engines. I know the intention of your blog is to make money (based on the ads you have on it) so more traffic = more income. We love you Sire so we would like to assist you in finding a balance in the monetization style of your blog. I also read Holly’s post about in text links and agree with her about making sure they are not in comments. You already know that I don’t favor them but I can easily ignore them in the body of posts. I do discriminate against blog posts that place AdSense ads between the title and text when I’m linking out to other blogs and when I decide what to review and share at StumbleUpon, Twitter, Facebook, FriendFeed and Delicious (although I sometimes make exceptions for exceptional content and people like you because I like you). I know that those who make big bucks with AdSense ads advise putting them there; however, if that page gets shared less and less incoming links wouldn’t it earn less too? There is a study that needs doing. .-= GrowMap´s last blog ..Wedding Boom Predicted for Next 22 Years =-. I could swear the post I was looking at did not have KeywordLuv on it, but the one I just commented on, reviewed and shared did. Sorry – I can’t always remember everything. Thank goodness for Tomboy Notes! When I first started blogging it was because I thought it would help the ranking of my website. Now I do it because I fell in love with it. As for my intentions of blogging being money orientated, I don’t think that’s entirely true. Sure I have ads on my blogs and I enjoy the few dollars that come in because it means that I’ve done something right, but if I was really interested in the money aspect I would have given it up long ago. Most bloggers do just love it. Most of us are working to find the balance between our content and generating some income so we can do more of what we love! The wedding niche is heating up and we have a great gift affiliate program for it and an easy way to add a wedding store that contains products from 40+ merchants that updates itself daily – all with one line of code. Check out the post in CommentLuv and the Bridaluxe Wedding Affiliate Program. .-= Sire´s last blog ..The Honest Truth About Blogging For Money =-. Sire makes a good point about blogging for the fun rather than focusing on keywords and money – I too sometimes feel I would enjoy blogging more without spending so much extra time on keyword research – but then again if you simply write for fun you’ll be writing for an audience of one – and despite what I naively said in some ancient high school bio “I write because I must” it just isn’t as much fun if you write without someone actually reading it. .-= Chris@ K&N Air Filter´s last blog ..How to Green Your Car with a Re-Useable K & N Air Filter =-. Most definitely targeting proper search terms and keywords is half the battle. Sometimes people get caught up in very competitive keywords which is really a mistake as it may take a long time to rank, but looking for the lower competition terms and lots of them can get you ranking in tons of long tail phrases and bring traffic for a long time to come. One of the things I recommend for most people is getting someone to assist them in understanding this clearly or even in selecting their anchor text for them. It is so important and most still just don’t “get it”. That is an interesting link you shared there. I saw that toolbar somewhere before – probably on your site. I hope you’ll share some tips on how you’re applying the information you get from it. Maybe some who do understand keyword research should offer to select keyword phrases for others for a flat fee per keyword phrase or set of six or something. It can often be faster to just do it than it is to teach someone else – and eventually they would start understanding. It’s a great line from the movie Field of Dreams isn’t it. This is one of my favorite movies. However, it’s so UNTRUE in Internet. How many people out there have put up a website with great expectations and nobody came? Answer: Just about everyone…but if you stick to it, they do come! .-= Richard@How To Videos´s last blog ..How Do I Download Songs Onto iTunes =-. Way back in 1996 I wrote a page about the most important part of getting found on the Internet: Location, location, location. It is much easier to get traffic from where it already is than to wait for it to find you. You must reach out to other sites (including search engines) if you expect to be successful. Since I use Ubuntu I can not test it out; however, I thank you for your input. Automating can sometimes improve our productivity but is usually not as targeted or specific as what we do manually. .-= Gail @ Support Small Businesses´s last blog ..Recommended Wedding Affiliate Program: Bridaluxe =-. My biggest challenge is remembering to link a person’s name to strong anchor text while I’m writing a post. This is a good reminder to slow down and use more creativity when linking to another blogger. .-= Barbara Swafford´s last blog ..The Shortest Lesson Ever =-. Great to see you here as I know how very busy you are. Bloggers are going to be really challenged to understand this whole keyword research and anchor text concept. Each blogger has to figure out what it is they want to be found for in the search engines, decide what the very best keyword phrases are for them and also the best page for each phrase and then use that information in comments and guest blog posts. We may even want to share that information on our about page or at least with other bloggers who link to us. Blog names and the bloggers name are not actually the best anchor text and this is not an easy task – but it is a VERY important one. Keyword research is one of the key steps. Having a plan usually determines if you or your business is going to be successful or not. Have a plan and stick to it. Everyone who has ever been successful has had a plan that they have followed. The challenge is for businesses to know whose advice to believe. There are so many authority writers sharing disinformation and many more who think they know what works based on that misleading information who have never actually tested it that most are lost before they start. The plan must be one that is proven to work and many are following plans that will get them almost nowhere. That is exactly why this blog exists: to share free, proven methods that DO work with those wise enough to recognize the truth when they see it. Which you said in beginning of the post that we should know about our niche keyword or phrase that will be used by the followers and will make easy to access to your site. This is very nice post, i always wanted to increase the traffic in organinc sense. Thanks for your help, by showing me the right way to increase the blog traffic. The tools you have mentioned are quite useful. So many people are building links without the basic knowledge they need to know which links matter. Incoming links without keyword research that are not using the best anchor text or landing on the wrong pages are not going to accomplish very much at all. In addition to wordstream, I have used wordtracker’s free tool at freekeywords.wordtracker.com. This one shows you the number of searches for your keyword, and variations including your keyword, but then you can click a variation and drill down to see even more variations. It gets me to more options faster, IMO. GrowMap, what do you think? For example: an initial search for ‘affiliate’ yields 486 searches. One of the variations is ‘affiliate programs’ with 357 searches. Variations on this keyword included: ‘wealthy affiliate program’ (64) and ‘wealthy affiliate money making program’ (45). These last two, which are sort of wierd and long, actually have more volume than ‘best affiliate program’ (24). .-= Daneka@best affiliate programs´s last blog ..What Affiliates Want From their Affiliate Offers =-. 1) Many people use toolbars to search and instead of backing up and going forward they will search repeatedly. That is important to know because one person might have generated most or even all of the weird search phrases you see so you don’t want to target those. 2) In your specific example, both of those phrases refer to a specific Web site called Wealthy Affiliate. That link is to a review Wanda and Paula wrote about it. While some people might be searching for general information to become a “wealthy affiliate” most of those searches are going to be for that specific Web site. Why don’t we talk via chat? You have some unique challenges and your company has one major selling point over any other affiliate management program I’ve ever seen: no start-up or maintenance fees for merchants. If you want to attract clients, you can’t be invisible. You have to work for it and find those clients. .-= George Passwater´s last blog ..27 Ways to Help You Find More Work =-. Welcome George and thank you. I have found that even major sites that are already PR5 and have much traffic do not apply this specific concept. I am hopeful that my readers will believe me when I strongly recommend that what this post explains really does need to be made a priority – and the sooner the better. .-= Internet Strategist @GrowMap´s last blog ..MEME: LinkLuv to My Fav Bloggers Favs =-. I’m somewhat a believer in the “If you build it they will come” approach insofar as you need to have a quality product once people find you. GETTING people to find you is a whole other story. Personally, I don’t think I’ve done near enough work with keywords. The links you provided to the free keyword research were a huge help in that regard. Thanks! .-= Spot@tech blog´s last blog ..Nikon D80 vs D90 vs D300 =-. If you don’t have quality content they won’t STAY even if you get found; however, there are many excellent blogs and Web sites that get next to no traffic because they don’t understand the concept that I am writing about in this post. I truly hope people take me seriously when I say “Make this task your highest priority today. ” The sooner they get started the better. Until you know who your audience is and what phrases you want to target getting incoming links from other bloggers or sites or using CommentLuv and KeywordLuv may be a waste of time. When you start collaborating with blogging buddies you need to give them the specific pages and anchor text you would most like to have them use when linking to your site. Most just link blog or business names which is far less effective at driving more traffic and business. .-= Internet Strategist @GrowMap´s last blog ..Today Dec 1, 2009 is the FTC Disclosure Deadline =-. Thanks for excellent tips. It is no surprise I look to you for advice on how to grow traffic to my site TipTop, the real-time, semantic, social search engine that you mentioned. Thanks. TipTop is a great place to research anything, find useful leads for B2C or B2B, discover interesting people and build relationships, and also spread the word about your business. My Twitter followers may notice that I Tweet about Tip Top Twitter search engine hoping they’ll realize how handy and valuable it can be. I’m still planning to write one or more posts with tips on how businesses and bloggers can use your semantic search engine for business promotion and brand management. That will give you incoming links to get your FeelTipTop site onto the first page of the search engines when people search for “Twitter search engine”. That is the phrase I would expect most people to use to find what you offer when they don’t know your specific product. .-= Internet Strategist @GrowMap´s last blog ..Tools Wanted for Power Bloggers, Social Networkers =-. The perfect key questions. I think that we should always be guided of the two key questions so that we may never be mislead. Thanks for sharing this helpful article. If you do what I recommend in this post for your business you will definitely be able to increase your organic traffic. After you get the phrases you most want to target use them on blogs like mine that use both CommentLuv and KeywordLuv to create your own anchor text. The reason this is important is that you can get specific pages ranked for specific keyword phrases. To use printing as an example, if you had a page where people order or create their own business cards you could use Luigi @ Order Business Cards to make “Order Business Cards” your anchor text that is hyperlinked by KeywordLuv to that specific page. As you gradually add more links to that page using one or more phrases (you might also use “buy business cards” and “order business cards online”) that page will move up in the search engines for those searches. I know KeywordLuv confuses many people because so few use it. Anyone who still doesn’t understand is invited to ask questions until it becomes clear to you. I don’t want you to miss out on making your own content easy for searchers to find. .-= Internet Strategist @GrowMap´s last blog ..MEME: Share What Makes You Feel Thankful =-. Oh my how often you see someone jumping up and down because they now rank #1 for this ridiculous word or that meticulous phrase until they’re asked, how many are searching for it? .-= Dennis Edell´s last blog ..Blogging Halted Here – Don’t Despair, This Is A Good Thing! =-. You’re right Dennis. Just as trying to rank for the most high traffic, general keywords is a losing cause for most – ranking for anything that your users are not searching for won’t be bringing you any traffic. 2) DO use the tools I suggested to find phrases that your audience are already using and target the ones that are attainable, i.e., are fairly specific two to three word phrases with moderate searches. Skip the first few and target the most relevant to what you are linking and writing about. I think it is a great idea to brainstorm about how your target audience may try to find you online. You are only one person, so it would only make sense to ask other consumers out there what they are looking for. I optimize for coffee keywords, and you would be surprised at what some people search for! Many businesses make the mistake of assuming their potential buyers know their industry jargon and the “proper” names of their products. I am continually showing them proof in search tools of how far from the truth that is! Any blogger or business can ask their co-workers, friends or family what they would search for to find what they offer. Most of them will be in for big surprises. Sit them at a PC and watch how they try to find you. This is FAR more accurate than asking or taking surveys. You can apply the same concept to do free usability testing on your Web site. Bring up your site and watch as anyone who hasn’t seen it before uses it. Ask them to perform specific tasks and see how they do. If more businesses did that there would be far more better and more usable Web sites. .-= Internet Strategist @GrowMap´s last blog ..Better Live Chat Equals More Closed Sales =-. This is really very nice guide for start a home business. Yes keyword research is very much important for improve our online business. First we should have to target to some less popular keyword so that we can get rank easily. .-= work at home jobs´s last blog ..Great list of work at home scams sites =-. We have many posts that are perfect for those who are growing blogs or businesses or want to work from home like we do full time. Skim the categories in the right column and check out our Best of GrowMap post. Thank you for the information, Yes your blog is really very interesting. So I have already subscribed to your blog. .-= work at home jobs´s last blog ..How work at home data entry scam work? =-.